In professional wrestling, the designated hero in a match is known as the “face” (short for “babyface”) and the villain is the “heel.” At the other end of the socioeconomic spectrum, pro golf suffered a sudden face shortage when Tiger Woods turned “heel.” The sport was temporarily rescued Sunday by the popular Masters victory of the 39-year-old—but still baby-faced—Phil Mickelson, a prodigiously gifted goof whose career hasn”t matched Woods’s because his judgment on the course, a combination of daring and knuckleheadedness, has often been as unreliable as Tiger’s has been off the course. Despite the millions of words uttered about the Tiger imbroglio, one question has been seldom aired. Back in the 1990s, the young golfer was mentored in his now notorious bachelor-party-in-Vegas lifestyle by NBA superstar Michael Jordan. Why did the golfer’s fans turn on him, while the basketball player remains a face? Granted, Jordan never got caught in quite so embarrassing an incident. Yet, one broader difference is simply that pro basketball and pro golf have culturally different fan bases. Golf aficionados are the most conservative and civic-minded of the fans of major spectator sports, while NBA addicts are the least. Although golf has developed more of a frat house vibe over recent decades, the game still has higher standards of behavior than the NBA. For example, Magic Johnson could get himself infected with HIV in some manner that I don”t even want to think about without denting his popularity. NBA-style tawdriness, however, is more upsetting to the golf world. When it comes to marriage, for example, a touring pro is typically allowed one discreet mulligan, but a second divorce can expose him to comment on the fairway. Yet, isn”t it just a stereotype that golf fans are more traditionalist? A new survey of the athletic and political tastes of 218,313 American adults confirms old stereotypes and identifies fun new ones. The Politics of Sports Fans from the marketing research firm National Media Research, Planning and Placement includes a sophisticated graph that rewards careful scrutiny: Your browser may not support display of this image. Fans of PGA golf are represented by the red disk in the upper right corner. They both vote the most Republican (which is why they are farthest to the right on the horizontal Party axis) and just plain vote the most (they are nearest the top on the vertical Turnout axis). The larger a sport’s dot, the higher the percentage of grown-ups who say they are “very interested” in it. Not surprisingly, pro football (the big red “NFL” disk near the center) has the most, and most-average, fans. The least likely to vote are pro wrestling fans (the pale blue dot in the lower left). The most Democratic are the small number of fans of the Women’s NBA, while the NBA’s fans are the second most liberal. Among devotees of country club sports, why are tennis enthusiasts more Democratic? For one reason, golf demands about one hundred times as much land per player as tennis, so recreational golfers tends to be suburban/exurban, while tennis players are more urban/suburban. Republicans need room. The women’s versions of golf, tennis, and basketball all lie modestly to the left of the men’s versions. LPGA fans tend to be older married couples who play golf together (Republican) or lesbians (Democrat). For example, the first major championship of the ladies golf season, last week’s Kraft Nabisco LPGA Championship, famously draws many thousands of lesbians from around the country for a spring break party. Yet, the atmosphere at the tournament still follows the decorous norms for golf tournaments. Although “NASCAR Dads” became a clichÃ© for conservatives during the 2004 election, both golf and college football lean even more toward the Republican side. On the other hand, it could make sense for campaigns to target NASCAR Dads rather than, say, PGA Fathers, because the lower turnout racing buffs need more reminding to get to the polls. 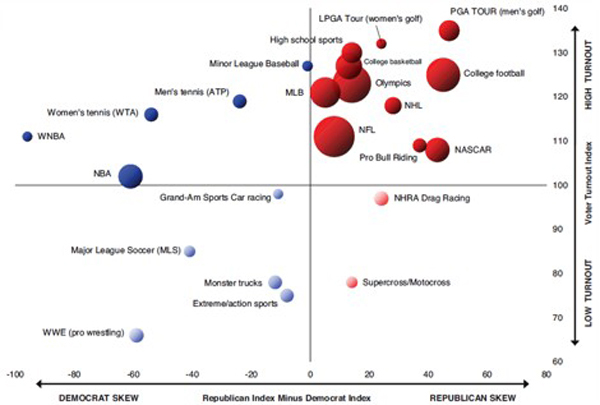 Other than the NBA, each major sport attracts fans who are more Republican and more likely to vote than the national average. In contrast, another NMRPP graph shows that the audiences for most entertainment TV shows fall in the lower left quadrant: Democratic and apathetic. The surprise hit sports film The Blind Side, a rare Hollywood movie made by a conservative director, John Lee Hancock, was based on the true story of a wealthy Christian Republican couple, played by Oscar-winner Sandra Bullock and country singer Tim McGraw, who adopted a giant black youth and groomed him to play football at their alma mater, Ole Miss. The movie unintentionally exemplified how sports consume so much conservative energy and wealth in America. Generalizing massively, sports skew Republican and entertainment Democratic. Which is more useful to control for propagandizing for your Party: the games or the stories?